Sure winners, these classes offer a take home prize to boot! With an abridged version of the Stenciling Essentials class, each project class will provide you with enough knowledge to get a feel for stenciling and yet still have time to finish a project you can take home. Most classes run about 2-1/2 hours. Project classes are also a great way for you to host a few friends to fun private stencil party at your home. Sound interesting? Click here for more information. Costs include all materials to work with unless noted. Although we do not insist on taking the Essential class prior to taking a project class, doing so, or previous stenciling knowledge will greatly enhance your class experience. ADVANCE PAID REGISTRATIONS ARE REQUIRE PRIOR TO CLASS DATE. 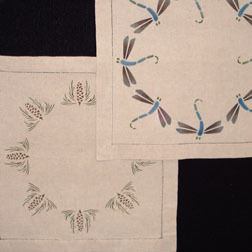 Create a charming table linen with either dragonflies or pine motif to take home in this easy class. 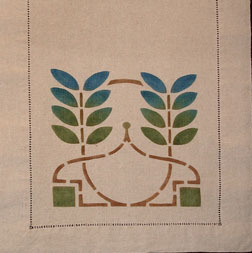 You will layout a spot design in a circular pattern on a square linen. Think this sounds tricky? It’s not when you learn some simple techniques to help you! Cost includes all materials to work. In additional to keeping the textile you’ve created, you can purchase for $10, the special class stencil (not otherwise available) if you wish. 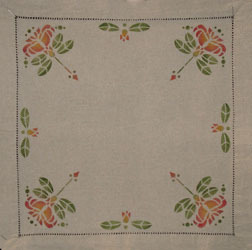 Using a smaller version of our floral spot stencil, you will learn to adapt the design in various ways to produce a lovely linen table square to take home. In additional to keeping the textile you’ve created, you can purchase for $10, the special class stencil (not otherwise available) if you wish to keep it. 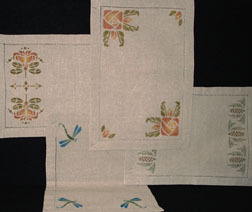 Come create a pair of place mats using your choice of one of four designs – dragonfly, pine, tea rose or small floral spot – with a variety of stenciling options to boot. A great class to play with your creativity. Additional place mats will be available to purchase, as well as the special class stencils, so you can create even more place mats at home. 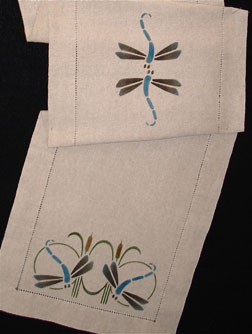 Using a modified version of our popular 5″ dragonfly stencil, you will create an attractive table runner to take home in the colors of your choosing. All materials to work with are supplied and you can purchase your special class stencil (not otherwise available) if you wish to keep it. We’ll be using an original Gustav Stickley stencil design to create a beautifully shaded table runner in the color way of your choice. All materials to work with are supplied and you can purchase your stencil at at a discount if you wish. This class will challenge you to go outside of the stencil design. 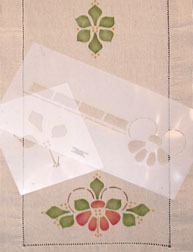 We will adapt an original vintage two part stencil design to create a whole new look on a linen table runner. And, in addition to taking home your runner, you can also purchase your class stencil at a discount if desired.